In 1990 Robert Smith and Chris Braithwaite attended the EKKA in Brisbane to see the cattle judging. At this show we saw for the first time the new breed called Gelbvieh which caught our eye at first sight. We decided to investigate this breed and found that the figures issued by the Clay Centre in Nebraska USA ranked the breed very highly in all areas. We then decided to invite other participants into a joint venture to breed Gelbvieh. With this Mike Agnew and Graham McAllister joined the team. Cattle were bought from people such as Lionel Busquests and Steve Sullivan in New South Wales, and were transported to our property near Murgon in Queensland. Embryos were purchased from Jerry Mettler in USA thereby using the latest genetics available. A herd of approximately 60 stud females was built up over the following 6-7 years with bull sales to all parts of Queensland. In 1998 each member of the group were being pressured by their other commitments and therefore could not apply enough time to the venture so the female herd was distributed evenly amongst the group and Chris Braithwaite took on the Midas Stud name. Since then Chris has been building numbers again and with the introduction of new genetics the herd has improved dramatically. 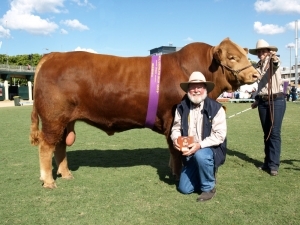 In 2004 Chris started to show his cattle at the country shows with a small team shown by the Wondai State School. With this we have achieved great success with many wins locally and in 2006 won the Champion Gelbvieh Cow at the EKKA and Supreme Female Exhibit at the Wondai Show. Since this time, Midas has continued to exhibit successfully at local Shows as well as the Brisbane EKKA and Sydney Royal Shows. Full details of the Midas showing success can be found on our news page.